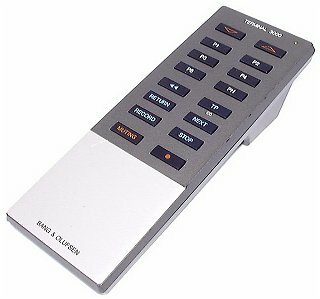 As the terminal for the Beomaster 3000, the Terminal 3000 replaced the ultrasonic Beomaster Control Module that had been supplied with the Beomaster 2400 and 2400-2. The terminal offered basic control of the Beomaster, but because the 3000 system included Datalink, the record player could be started and stopped and the tape deck functions could be operated, including recording. Because of a shortage of space for keys, there was no fast forward key, though “Advance” and “Return” keys were provided for skipping tracks. The TP key was also marked “CD”, though this was clearly an afterthought. Selection of a CD player (probably a Beogram CD X) could only occur if the selector switch on the Beomaster had already been set to “TP2”, and even then, the connected machine could not be remote controlled. Extra Terminal 3000s could be ordered for use with the “Link 30” multiroom system. Text copyright © Beocentral. Unauthorised reproduction prohibited.